I took calculus once, and ever since visualize experiences as points on a curve. Each memory corresponds to a point on this wave, invariably encompassing references and intersections with other lives, other histories, other curves. These associations, no matter how precise or ill-remembered, become additional points that define the curve. It is exquisite that between any two points there is no limit to the number of additional memories or moments that may be added. The space between any two points is infinite. It retains the capacity for the perpetual addition of information, descriptions, histories, ideas. The curve grows without growing, expanding immeasurably, possibly imperceptibly, infinitely. Memories are experience. The moment events happen is our reality; they only become experience in retrospect. And so, I wonder why stories of our ancestors are important to us – assuming they are. The ways in which we tell those stories are our experiences too. They are points on our sine curve of experience. This isn’t just a metaphor. It is actually science. Moshe Szyf and Michael Meaney, two scientists working in the field of epigenetics at MacGill University, presented a paper in 20041 that opened the possibility that our DNA might carry epigenetic markers that are defined by our life experiences. In other words, they found that molecules that attach themselves to DNA could control whether a gene would be turned on or off. Because these groups of molecules reside on the outside of, but attached to, the gene, the field is called epigenetics from the Greek prefix for outer, epi. The paper grew out of studies earlier in the decade on rats whose mothers were either more or less attentive. Rat pups whose mothers were doting were far better able to cope with life stress. Those whose mothers neglected them had comparatively under-developed coping abilities. While these notions sound like Pop Psych 101, a radical idea resided in Meaney and Szyf’s proposal: not only did the physical attention of the mother rats affect their psychological prospects, they also fundamentally impacted the pups’ heritable genetic makeup. 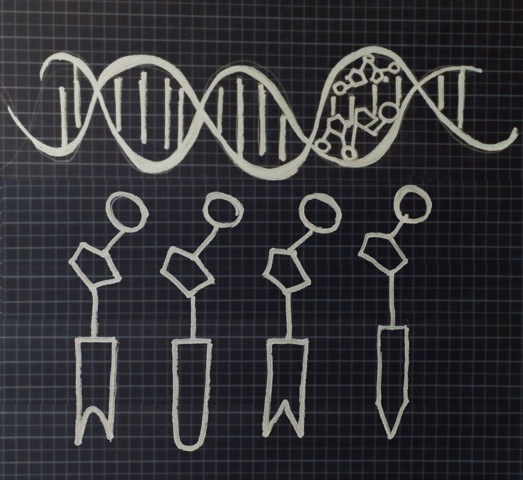 Here is where the epigenetics come in: Meany and Szyf offered that methyl groups – organic molecules in brain and skin cells that tell each gene how to evolve – actually control the development of that piece of DNA. What Meaney and Szyf suggested was that life experience could impact the ways these methyl groups work. Not only could a mother’s neglect be a psychological factor in her child, but also such a “genetic scar” could subsequently get passed on to future offspring. While in the realm of science these discoveries set off a revolution of inquiry in behavioral epigenetics and the prospects of new genetic treatments for illnesses like schizophrenia and depression, Meaney and Szyf also proposed that family mythologies are far more than stories, traumas or memories, and are literally grafted to our genetic makeup, part of our biological beings, altering our genetic legacies. Meaney and Szyf’s work suggests that our experiences and those of our forbears are indelible. Truly indelible as they embed into methyl groups piggy-backing on our DNA, nudging the genes in one direction or another. They “become part of us, a molecular residue holding fast to our genetic scaffolding.”2 While science explores ways to “correct” what may be deficient in these past experiences, I’d like to delve into this space of unknowing. These are stories, from the curve of my personal history, of what I think I know; perhaps these events are encompassed in my methyl groups, inducing the evolution of my DNA. Anna and Giovanni Raicovich, in Pola, Italy, early 1940s. 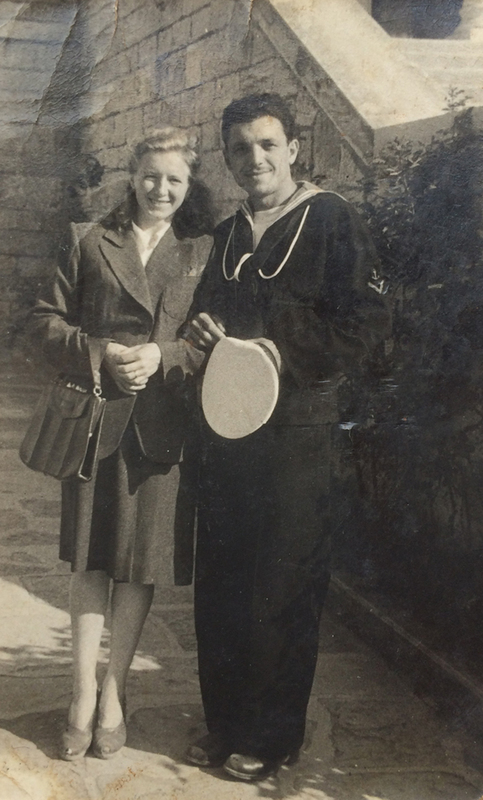 Giovanni is posing in his navy uniform, where he was a cook. Nonno’s hands are what I remember most. He had thick fingers and his nails were always clean, sometimes nicked. He was a cook in the Italian Navy and since that is what he knew, he was a cook when he arrived in New York. He was eventually called chef and later had his own restaurant. He had dark curly hair, deep brown eyes, and a mustache above a broad and ready smile. Happiness. He exuded a calm happiness that made me feel comfortable whenever he was near. He didn’t have to say anything, I just loved his presence. He used to give me $1 for “doing” his hair—an amusing exercise as he was mostly bald, and had a halo of soft hair just above his ears, that ran around the back of his head. If he hadn’t had his hair cut in a while, you could see the curls start to form. I used to comb it, then brush it, and give him a scalp massage. Usually after dinner on Friday nights, before my little sister and I passed out on the plastic-covered couch and then were sent home with shopping bags of massive, ripe tomatoes Nonna had grown in her garden in Astoria. She grew them from seeds tomatoes from the year before. These tomatoes are part of my genetic code. Their smell and weight and color and texture. In late summer, I know which ones are best. I am fearless in paying extortionist greenmarket prices to slake my hunger for the mystery of their impact on my genetic composition. Late last summer, I bought 28 pounds of heirloom tomatoes from a local farm near my parents’ home on Long Island. They looked like my grandparents’ tomatoes. I made tomato sauce and canned it so we would have it all winter. The ghosts insist that I do things the long way, the slow way, because I know that these tomatoes embody certain perfections because that was their route to existence. The meat slicer produced the exquisite sound of a blade moving fast, slicing through the fat and flesh of prosciutto. Cured meat hung from the rafters. In the refrigerator, humming away since the 1960s, small bottles of seltzer and tonic water and Coke, as well as supplies that could be converted into a meal if unexpected guests stopped by. Cases of wine, extra chairs, tools, appliances that needed a little tweaking, all inhabited the cantina. This was Nonno’s space. Among the most important occupants of this dark, fragrant space was a white ceramic saucer with a burgundy rim, something taken home from the restaurant. It rested on the butcher block. Its contents: a dried watery stain, tinted orangey-red, with yellow seeds that dotted the ceramic. It looked like the ceiling had leaked and left its mark on that small plate. The grotesquely deformed tomatoes so expertly grown in the garden came from this plate. At the height of each season, the seeds of choice examples were selected and dried for the next year’s bounty. Then they grew, inbred, lumpy and juicy, with scars running from their calyces, marking longitudinal seams. My grandparents’ own homegrown genetic experiments. The tomatoes grew in an improbable site; a small patch of ground behind a townhouse in Astoria, an immigrant community in Queens, New York. The soil was enriched by horse manure brought each year at Easter time from upstate farms where we procured freshly slaughtered lamb, and by leftover pasta, eggshells, and other organic refuse. Each year the dried seeds were reconstituted in small pots filled with soil, germinating in the cantina, only to be planted when they could stand outside. Eventually they would be staked, and watered and cared for, and finally would yield fruit. Some of the early green tomatoes were pickled, and while everyone commented on how delicious they were, we all craved the bursting red beasts that would come starting in July, hitting perfection in August. And when they arrived, they were so abundant that they were given away to everyone who came by. Varying in size and color, most improbably massive, a few petite and delicate, some deep, deep red, nearing purple at the height of ripeness, others orange and bright with specks of ochre. All were heavy for their size. The skins were thin and delicate, to be handled with care. We took our share home in white plastic bags recycled from the deli or hardware store. In the car home, the vegetal, acid smell of the tomatoes filled air, and as hard as we tried to be gentle, invariably one fruit’s skin would split slightly, leaking inside the bag. Tomatoes cut open revealed those yellow seeds, plumper than the dried ones on the plate in the cantina, and that vegetal scent emerged more strongly. In the salad they made a dressing of their own, combining intoxicatingly with salt and oil and vinegar. Sometimes just on a plate with salt and basil – almost too fragrant and smelling succinctly of summer. It was always hot when we ate these, even if it was under the grape arbor in the evening. Mosquito bites were part of the equation, but better than sweating it out indoors, so we were bitten. The tomatoes came out at the end of dinner. They were the most perfect, and as a result I can only eat tomatoes in July and August. It is as though the sweetness of the tomatoes went straight into my bloodstream, attracting mosquitoes in high numbers. The mosquitoes stalk me all summer, still, today. The tomatoes have marked my blood as a powerful draw to those vampiric insects, and my skin reacts with bold, swollen, rose-colored welts, terribly itchy. It is uncanny that I can sit outside on a picnic bench adjacent with people on either side of me and across, and yet I’m the only one bitten. And yet, I cannot resist sitting outside to eat. When the weather warms in spring, I push my friends outside as soon as possible, and am endlessly jealous of folks with outdoor space to eat. I offer to cook at their places. When I visit my parents’ in summer, I insist on eating lunch outside, and sometimes dinner too. But then, I am bitten, as I was under the grape arbor each Friday of my childhood summers when sitting in Nonno and Nonna’s backyard, eating their summer tomatoes. I must enjoy being this kind of magnet for the bugs. Perhaps it satisfies some deeper need. Everyone wants to be wanted, right? The mosquitos pick on me, and it sounds odd, but their picking me makes me special. In a weird way I’m proud of it. Why else write about it here? And when your family was once forced from their land, could it make some sense for me to want to be wanted in more eccentric ways than most? Impossible to trace or truly compare, but somehow, in spite of the itch, those mosquitoes are mine. This memory of my grandparents, Giovanni and Anna, and their life in Queens follows more dramatic events that began in Italy. 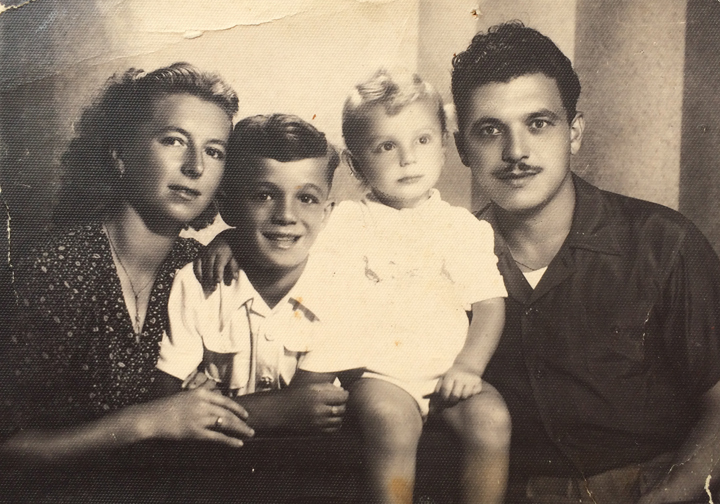 They, along with my father and his brother, had been refugees from their hometown of Traghetto, Italy – in Istria, a peninsula across the Adriatic Sea from Venice that became Yugoslavia after 1945. Anna, Guerino (about 6 years old), Ezio (about 1 year old), and Giovanni Raicovich, Italy, circa 1945. This photo was taken about the time the family left Istria for Genoa as refugees. Giovanni, Anna, Guerino and Ezio had a choice. Either stay and become Yugoslav, or leave as Italian refugees. They chose the latter; many of their family, friends, and neighbors chose to stay. Giovanni urged Anna to make the leap to America, but she insisted they stay in Italy. As “displaced persons,” they moved to Genoa, where Anna worked in a cigar factory. It was here, in the dismal living conditions provided to refugees, that Giovanni plotted his way to America. Finally receiving sponsorship by a Catholic-American charitable organization, they gathered the few things they had, and made their way to occupied Germany to meet a “Liberty Ship” that would cross the Atlantic. The story goes that their savings of $200 was sandwiched between the pages of my father’s comic book for safekeeping during the crossing. Anna was sick the whole way over. They landed in America, living in a cold-water flat in Hoboken, New Jersey; my grandfather got a job as a cook in a pizza joint in Brooklyn. Giovanni worked seven days a week, and disappeared from his family’s life for a few years – if he was home, he was asleep; if he was awake, he was working. Guerino tried to teach his mother English; he was in high school, where they called him Jerry. When Giovanni reemerged from his work-induced absence, they moved into a flat with hot water; this new-found luxury arrived courtesy of a job at Romeo Salta, a new Italian restaurant in Manhattan. Giovanni now made the transition from cook to chef. He wrote recipes and Salta turned them into a book. The restaurant was among the very first Italian restaurants serving northern Italian food in New York City. The dining room was formal (no candles in Chianti bottles, no red-and-white-checked table cloths) and the waiters were all friends and compatriots. In the time-honored tradition of the New York restaurant business, new immigrants came to restaurants through chains of connections; personal friends, acquaintances, relatives—the notion of cousins stretched beyond any traditional conception of a family tree—to create a web of accountability, and ultimately a sense of family. At Romeo Salta nothing was different. A crew of Giovanni’s and Anna’s compatriots from the old country joined him at Romeo Salta. Giovanni taught many how to run a restaurant; to arrive early in the morning to be sure the orders came in from the individual purveyors; to inspect the meat, fish and produce; and to prep the stocks, sauces, and braises for the day ahead. 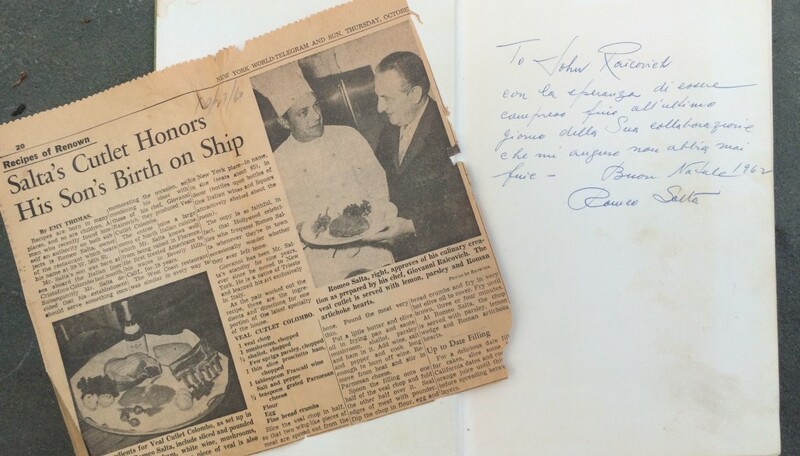 Inscription Romeo Salta wrote to Giovanni Raicovich in the Romeo Salta Cookbook (published in 1962), alongside an article from October 1960 in the New York World Telegraph and Sun with a photo of Raicovich with Salta. The article was found in the cookbook. Giovanni’s rigorous organization is in me. I feel it every time I design a new project, each time I embark on a new piece of writing. How do I prepare? Whose help do I need? What tools, books, articles, advice, would expand the effort? It also works in reverse, perhaps more powerfully. My grandfather’s mentoring emerges within me. I nearly always say yes to students looking for advice and feel incredible guilt when I cannot make myself available. I love helping students, interns, and others see what they need to see about their interests, connect them to other resources and people who can help. How to get from point A to point B. There is a measure of practicality embedded here. I myself have not been very disciplined about my life path. I have followed from one thing to the next instinctually, listening to my gut as my grandfather did when he knew he should convince his wife to move to New York. But I still hate to get up early. Maybe I didn’t get that methyl group. After years at Romeo Salta, there were outbursts and arguments between Giovanni and Salta. In the end, frustrated, Giovanni went out on his own and opened a restaurant. His place was called Per Bacco. His former colleagues, most of them relatives, over time, also left Romeo Salta’s and started their own places. Northern Italian cuisine in New York City became all the rage, entering the popular culture, and perhaps attaching its own history and experience to each diner’s methyl groups. Part of my DNA is indelibly altered and impacted by these stories, and so are my son Giacomo’s. I imagine my methyl groups looking like those tomato seeds, whether dried or plump, coaxing my genetic code into action, my cells into reproduction, my mind into being. The preparation and eating of food is central to my life in a way I cannot fully explain, as is my family and its stories. Now that Meaney and Szyf have done their work, I can imagine that even the fragments of experiences of which I am aware, not only connect me to my past, but are also a part of my cellular composition. They are literally within me. What do we do with this information? I imagine the fear my grandmother felt in leaving her hometown, crossing the Atlantic to the unknown of New York. That fear is embedded within my cells. Perhaps it is the same fear I feel when I consider major shifts in my own life. Maybe the thrill of the roller coaster rides I love so much also comes from that boat journey? Is my grandfather’s time aboard ships linked to the complete calm I feel when I am near the ocean and the deep peace I experience when floating in the waves? Am I tapping into the past on a cellular, genetic level? It reassures me that these experiences reside within my DNA, like barnacles on the rocks in the Adriatic Sea. I don’t know their function, and that uncertainty provides a space for my endless re-imagination of their influence. I can’t help thinking about the traumas, boredoms, and happiness my ancestors confronted. The memories, experiences in the form of methyl groups, highly specific experiences that impact our DNA, trace the sine curve of personal and collective experience, the ocean waves of identity. In a larger context, our memories and the experiences of our people, tell us about the curve of who we are; they define us. What Virginia Woolf called the “darkness of the future” which, it turns out, is not only figuratively, but also literally, beholden to the past and certainly related to our present, if not our future. How fortunate I feel to know that these life experiences don’t end with their happening, or with remembering them, they are within me, and now, us. Laura Raicovich is a writer based in New York. She is currently Director of Global Initiatives at the public art organization, Creative Time, and has been appointed President and Executive Director of The Queens Museum where she will begin work in January 2015. She lectures internationally, and has contributed regularly to The Brooklyn Rail. She is the author of “At the Lightning Field,” a lyric essay and parallel text to Walter De Maria’s renowned artwork, an excerpt of which was published in X-tra, Contemporary Art Quarterly, and “A Diary of Mysterious Difficulties,” a book based on Viagra and Cialis spam recently put out by Publication Studio.